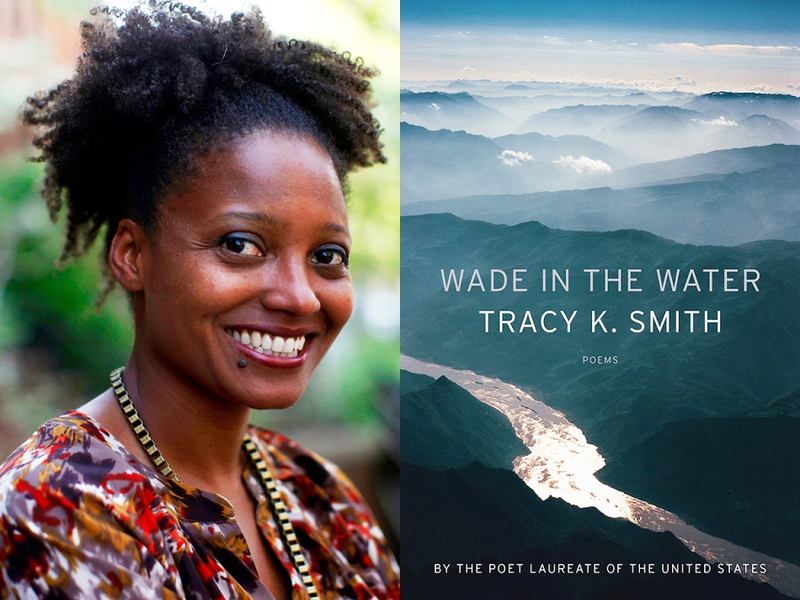 With “Wade in the Water” comes another vibrant and profound collection from Tracy K. Smith, Poet Laureate of the United States and Pulitzer Prize-winner for one of her previous books, “Life on Mars.” The much-awarded Smith presents in four sections thoughts on a surprisingly wide array of subjects that maintain cohesion through her consistently melodic phrasing and sparkling intelligence. Smith has a distinct poetic voice, one of compassion, wisdom, and insight, shown in lyric poems such as “The Angels” and “Hill Country” that tackle theological questions with a contemplative tone. In the latter poem, Smith writes of a God driving to a place in the country where he can be alone with his thoughts, one who is filled, as humans are, with more questions than answers, who also searches for something more: “If he tries—if he holds his mind / In place and wills it—he can almost believe / In something larger than himself rearranging / The air” (9). Her language is clear and her lines are meditative, with vivid imagery and resonating concepts leaving the reader with a sense of haunting. However, what is even more impressive than Smith’s lyricism is her scholarship, particularly in the second section of the collection, comprised almost entirely of found and erasure poetry. It begins with an erasure of the Declaration of Independence, simply called “Declaration,” a stark introduction to a series of poems consisting of lines from the letters of white slave-owning women and letters and statements written by African Americans during the Civil War. Of her longest and arguably most successful found poem, “I Will Tell You the Truth about This, I Will Tell You All about It,” Smith says, “Once I began reading these texts, it became clear to me that the voices in question should command all of the space within my poem. I hope that they have been arranged in such a way as to highlight certain of the main factors affecting blacks during the Civil War” (77-78). The poem itself is more than a poem; it is a work of historic preservation, of the power a poet has to give voice to the voiceless and often forgotten. And truly she has done the voices justice, arranging her sources beautifully. One of the poem’s sections ends with lines from a letter from a man to his wife, saying, “I want you to tell me the name of the baby / that was born Since I left // I am your affectionate Husband until Death” (28). The other standout poem in the collection is another long piece titled “Watershed,” which considers the Earth and what humans have done to it in a way that is at once elegant and dazzlingly grotesque. It is another found poem, this time comprised of pieces of an article on the harmful chemical substance PFOA and accounts of a near-death experience (NDE) from nderf.org. The poem begins with images of dead and dying cattle, “a dead black calf in snow / its eye / a brilliant chemical blue” (47) and goes on to explain PFOA in regards to a suit filed against its creator company. The poem’s didacticism is interrupted by a shockingly moving account of an NDE where the speaker moves through darkness to view the Earth from above as something totally alive and feeling: “The waters were living waters, the grass was living, the trees and the animals were more alive than on earth” (50). Towards the end of the poem, the idea of a universal benevolent love stands in sharp contrast with environmental destruction, as the NDE-speaker says, “Viewing the myriad human faces with an incredible, intimate, and profound love. The love was all around me, it was everywhere, but at the same time it was also me” (52). Speaking as a poet, Smith’s ability to combine topics of historic preservation, environmentalism, theology, family, and nature is as graceful as it is astounding. In our current political climate, it gives me hope to know that our nation’s Poet Laureate is a woman of color who is concerned with the past, present and future, as well as how to navigate all of these spaces, as artists and as people. While I have written about some of my personal favorites from the book, there is no way to do justice to the sheer scope of Smith’s work—you will just have to read it yourself. Is there a new release in poetry that you would like to see reviewed? Contact me at natalie.patterson@salem.edu with your ideas!